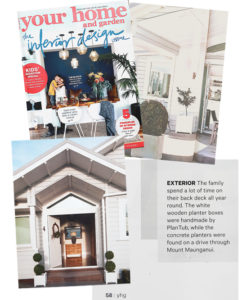 PlanTub NZ Coast Handmade Wooden Planters are featured in the current May 2018 issue of Your Home and Garden magazine. 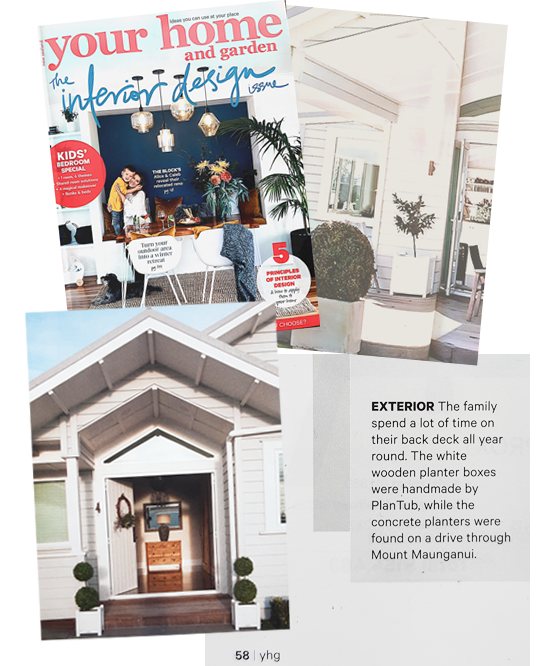 Be sure to grab your copy of Your Home and Garden today. PlanTub NZ Coast Planters are made from high quality hand selected NZ macrocarpa which is naturally resistant to damp, rot and insects. Handcrafted construction using traditional cabinetmaking joinery techniques is used meaning they will outlast inexpensive imitations. All PlanTub planters are professionally finished in standard or custom paint colours or natural stain. The insides are coated with waterproof membrane for extra durability allowing planting directly into the boxes. You won’t have to re-paint them for years and with a natural stain finish, they actually improve in appearance over time building up a rich patina and timeless look. PlanTub NZ wood planters will stand the test of time and is worth the investment when you think of the cost of having to replace cheaper alternatives.